1. Minimum purchase requirement of Php150. 2. Promo is open to all PNB Visa cardholders. 3. Only redeemable at the Front Counter in participating McDonald’s stores. 4. Not available at the Self-Ordering Kiosk, Take-Out Counters, Dessert Centers and Kiosks, and via Drive-Thru and McDelivery. 5. Cannot be exchanged for cash or used in conjunction with other promos. 6. Only one (1) McFlurry redeemable for every successful transaction using PNB Visa card. 7. 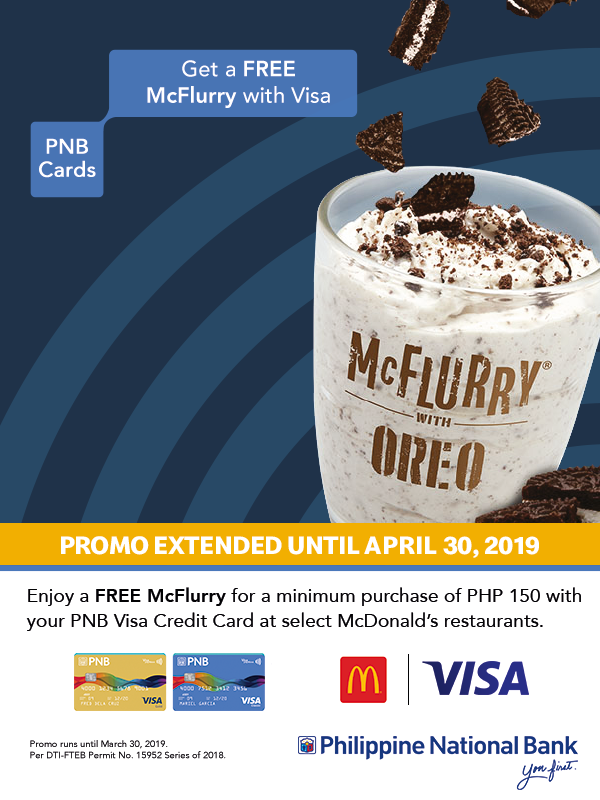 Promo applicable to McFlurry with Oreo, McFlurry with Milo, and McFlurry with Oreo Matcha. For McFlurry with Oreo Matcha, redemption will only be until February 15th 2019. 8. Promo is from January 4th to March 4th, 2019. 9. For complete mechanics, visit mcdonalds.com.ph.